Ray Troll - Karen Sobolesky & Co.
Ray Troll is Alaska's most well known t-shirt artist. His fishy paintings and drawings have migrated to museums and books and can be seen on t-shirts from here to there. Post Industrial Press, located in Tacoma, Washington, screen prints all of Ray's t-shirts, hoodies, and aprons. They also have Ray Troll ball caps and beanie knit caps. ​Namedrop: Minimum order 72 pieces. 50 cents per shirt. Namedrops are standard block lettering on the left sleeve. 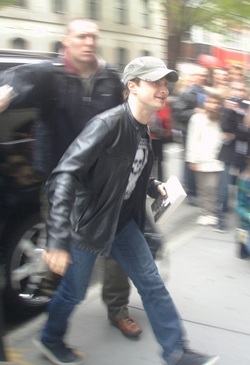 Daniel Radcliffe aka Harry Potter was spotted in New York City sporting Ray Troll's signature design "Spawn 'Til You Die" t-shirt by Post Industrial Press.